Using eco-friendly promotional items market your brand, but also indicate that your company is serious about environmental issues and sustainability. Wholesale Custom Water bottles constructed from recycled plastic find use for plastics that would otherwise take up space in a landfill and limit the need and use of bottled water which prevents additional non-biodegradable plastic bottles from making their way to a landfill. Our 24 oz. transparent bottle can be imprinted with your logo to increase your brand recognition while also doing right by the environment. 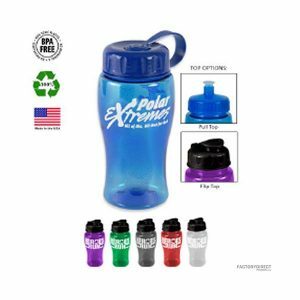 Our custom made reusable bottles come in a wide array of colors, but if you want something even more custom to hand out at your next tradeshow check out our overseas production for a slew of customizable features at low wholesale prices.